Heavy metals and metalloids, some of which are extremely beneficial for the survival of humans, flora and fauna can have devastating effects on same and the environment. Bioaccumulation and bio-magnification two methods via which metals and metalloids are assimilated into food chains as well as dermal and ingestion exposure to heavy metals and metalloids are believed by many residents in the Obuasi Municipality as leading public health threats to peasant farmers, their spouses and children. Risk assessment for three scenarios viz children, adult males and adult females were investigated using Average Daily Intake, Hazard Quotient and Hazard Index for ingestion and dermal exposure to metals and metalloids in soils at reclaimed sites backfilled with waste materials. Risk attributed to consuming staples namely Zea mays, Manihot esculenta and Musa paradisiaca cultivated at treatment (reclaimed) sites backfilled with waste materials and their corresponding control sites in the Obuasi Municipality were also ascertained using single/comprehensive contamination indices approaches and the soil-to-crop bio-concentration factor. Non-carcinogenic risk was absent from all three scenarios, adult male and female dermal absorption and children dermal absorption for arsenic with reference to agricultural use of the soil. Slight carcinogenic risks was observed for children at two treatment sites Nhyiaeso (1.28 × 10-4) and Sansu (1.08 × 10-4). Soil to cassava, soil to corn and soil to plantain transfer and bioaccumulation of studied metals in crops was low for all studied sites. With gold mining and environmental degradation being bedfellows, irrespective of the ownership, scale of operations or the continent that hosts a gold mine, gold exploitation always has varying detrimental effects on the environment, ecosystems services and human health . Gold mining activities usually result in the release of heavy metals and metalloids leading to hydrobionts toxicity  and the destruction of habitats of aquatic birds, fish, aquatic mammals and aquatic invertebrates . The colliery effluents from gold mining activities, which is rich in coarse and fine particles, darken surface water bodies which impacts on hydrobionts numbers and variety . Additionally, staple crops, food-chains and food-webs have been contaminated in several regions of the world by arsenic, cadmium, mercury and chromium as a result of man's affinity for gold and his resolve to get it at whatever cost [1,5,6]. Ghana, the eight hand second largest gold producer in the world and Africaa respectively has made huge economic gains from gold since it was first mined in 1471b to present albeit at massive environmental and public health cost as pertains in several regions of the world. For a country known in the pre-independence era as Gold Coast due to commercial quantities of gold across the length and breadth of the country, massive damage to its forest, rivers, scenic views and ecosystems by activities of gold miners should not at all be surprising. aMinerals Commission of Ghana, 2017. bMinerals Commission Ghana 2010. Heavy metals and metalloids pollution attributable to gold mining being a menacing public health dilemma ostensibly owing to bio-accumulation, bio-magnification and toxicity [7,8] has been a highly contentious subject with Ghana's law courts ordering investigation into perceived mining related contamination of farm produce in certain instances. With arsenic reported extensively in literature as chemical that causes permanent genetic change (mutagen), disturbs the development of an embryo (tetragen) and causes cancer , ascertaining its impacts on farmers and their households, with respect to ingestion and dermal contact in an arsenopyrite rich host gold mining community will go a long way to allay the fears of residents. The study will add to the body of knowledge on dermal and ingestion risk exposure which remains a paucity in Ghana. With the contamination of soils in communities hosting gold mining operations being extremely high, the reliance on risk assessment for the clean-up of heavy metal and metalloid polluted soils cannot be over emphasized . It is for this reason that a risk assessment of ingestion and dermal contact as a function of agricultural use of soil as well as an assessment based on soil to crop bioaccumulation which this study intends doing is relevant in the Ghanaian context. The Obuasi Municipality was created out of the former Adansi West District with Legislative Instrument L. I. 1795 and executive instruments E. I. 15 as the legal basis. The Municipality of sixty-three (63) Communities is situated between latitudes 5.35 °N and 5.65 °N and longitudes 6.35 °N and 6.90 °N and hosts the Obuasi Gold Mine, now Anglo Gold Ashanti in Obuasi its administrative capital (GSS 2014). The Obuasi Municipality, which spans an area of about 162.4 km², is located in the southern section of the Ashanti Region. The Municipality shares precincts to the west with Amansie Central District, to the east and south with Adansi South and to the north with Adansi North Districtc,d (Figure 1). d2010 Population and Housing Census, District Analytical Report. The climate is of the semi-equatorial type with a double rainfall regime. Mean annual rainfall ranges between 1250 mm and 1750 mm. Mean annual temperature is 25.5 ℃ and relative humidity is 75% - 80% in the wet season (GMET 2014). The vegetation is predominantly degraded semi-deciduous forest. The forest consists of limited species of hard wood, which are harvested as lumbere,f. Several communities in the Obuasi Municipality prefer to consume water from boreholes or hand dug wells due to the popular belief that the water flowing through taps is often contaminated with heavy metals associated with miningf. Eighteen (18) soil samples from eight (8) holes from four (5) locations (Figure 1) within a 20 km radius of the study area used for farming by local residents were collected using a combination of hand-auger, and power-auger methods to a maximum depth of 40 cm due to the ability of cassava tubers one of the stable crops under investigation to grow to a depth of 40 cm in the soil. The collected soil samples (treatment and control) were bagged in a plastic containers labelled and analysed for arsenic, chromium, cadmium, copper and mercury using X-ray Fluorescence (XRF) as described by  at a temporary field laboratory in Obuasi. The labelled bagged samples were stored in a cool box and transported to the accredited laboratory of Maxxam in Canada where samples were again analysed by inductively coupled plasma mass spectrometry (ICP-MS)g following aqua-regia digestion for quality-control purposes. gICP-MS is a type of mass spectrometry capable of detecting metal concentrations as low as one part in 1015. A total of 21 vegetation samples (including duplicates) were collected from the rehabilitated footprint areas and control sites (Figure 1). Each sample consisted of individually collected vegetation matter of Manihot esculenta (cassava root), Zea mays (corn) and Musa paradisiaca (plantain) staple crops within the Obuasi Municipality from within a 20 m radius. In order to get district-level background values, control samples were purchased at a local market. Manihot esculenta, Zea mays and Musa paradisiaca samples were weighed, dried, re-weighed and crushed prior to shipping to Maxxam in Canada for analysis of metals and metalloid by ICP-MS following digestion in a 1:1:1 mixture of ultrapure (ARISTAR) nitric, hydrochloric and perchloric acids at a solid: solution ratio of 20:1. All analyses of soil and vegetation were performed in conjunction with a range of standard QA/QC measures ostensibly to enable the calculation of sampling variance, analytical variance and instrumental accuracy/precision. The QA/QC measures used included regular verification of instrument calibration against independent standards; regular measurement of blank samples; regular measurement of laboratory control samples; consistently measuring duplicate samples and regular measurement of spiked matrix samples and matrix certified reference materials. Other QA/QC measures used were collecting and analyzing field duplicate samples at a frequency of 5% of total samples, analyzing certified NIST reference standards, and repeating analysis of samples at a frequency of 1 in 20 analyses. In order to minimize uncertainties generated by demographics, environmental differences and varying characteristics of human beings during the assessment [12,13] data on body weight and life expectancy at birth were obtained from field measurement and Ghana Health Services. For data gaps such as the ingestion rate of soil, exposed skin surface area, soil adherence, dermal absorption factor, slope factor, oral reference dose and unit conversion factor for which localized Ghanaian data were not available, data was curled from the United States Environmental Protection Agency and literature. Heavy metal exposure to receptors namely farmers, their spouses and their children were considered in the (agricultural) exposure scenario because more than twenty-two percent (22.3%) of households in the Obuasi Municipality have agriculture as their source of livelihoodh. Children were included in the receptors due to the practice in Ghana where the children of farmers often play on farms whilst their parents work. The children especially the toddlers have a habit of inserting every object they lay hands on in their mouth thus putting them at risk. h2010 Population and Housing Census, District Analytical Report. The daily exposure doses of arsenic, cadmium and chromium which represents the mean quantity of arsenic, cadmium and chromium per kilogram body weight an individual might take in daily, often averaged over the duration of exposure extended time period via ingestion, and dermal contact were determined and expressed as units of contaminating body exposed per unit of body mass and day [13,14]. The exposure equations recommended by the United States, Environmental Protection Agency  and the Contaminated Land Exposure Assessment (CLEA) by the United Kingdom Environmental Protection Agency was adapted. Where: ADII = Average daily intake ingestion (mgkg-1 day-1). CS = Concentration of heavy metals and metalloid at the exposure point (mgkg-1). SIR = Soil ingestion rate: 100 mg soil day-1 for adults & 200 mg soil day-1 for children in the age range 1-6 years . CF = Unit conversion factor of 10-6 kg mg-1. FI = Dimensionless ingestion factor (1) . EF = Exposure frequency of 255 days year-1 (based on farming season in Obuasi, Ghana). ED = Exposure duration of 25 years . BW = Body weight of adults and children 70 kg and 16 Kg respectively (field measurement). AT (Average Time in days) = ED × 365 days for non-carcinogens . AT (Average Time in days) = LT × 365 = 22,776 days, for carcinogens . LT = Life Expectancy at birth of 62.4 years in Ghana (UN, 2017)i. Where: ADID = Average daily intake of heavy metals via the dermal route (mgkg-1 day-1). AF = Adherence factor (0.2 mg/cm²day-1). ABS = Dermal absorption factor (0.03 unit less). AT (average time in days) = LT × 365: 22,776 days, for carcinogens. EF = Exposure frequency of 255 days year-1 for adults and children. AT (Average Time in days) = LT × 365 = 22,776 days, for carcinogens. SA = Exposed skin surface area (0.122 m2) for male adults feet and hands (0.1055 m2) female adults feet and hands and (0.121 m2) for children feet, arms, legs and hands . BW = Body weight of adults and children at 70 kg and 16 Kg respectively (field measurement). Risk characterization was done by calculating Hazard Quotient (HQ), the ratio of the potential exposure to As, Cd and Cr and the level at which no adverse effects are expected . Relative bio-accessibility (RBA) the ratio of bio-accessible arsenic to the total arsenic content in the soil  was used in equation (3) to ensure the actual HQ was estimated with the bio-accessible arsenic obtained from the Physiologically Based Extraction Test (PBET) since not all the arsenic in the ingested soil was bio-accessible for both adults and children in scenario 1. If the value of Hazard Quotient (HQ) is unity or less than one, (HQ ≤ 1) it is considered an acceptable level  and thus the heavy metals under investigation posed no health risk to the residents of the Obuasi Municipality. A HQ greater than one (HQ ≥ 1) indicates a relatively high non-carcinogenic risk with reference to human health (USEPA, 2001; USEPA, 2014) [16,17]. RfDoA, RfDoCr, and RfDoCd represent oral reference doses of arsenic, chromium and cadmium with values of 3.0E_4 mgkg-1 day-1, 3.0E_3 mgkg-1 day-1 and 5.0E_4 mgkg-1 day-1 respectively . Risk characterization was done for arsenic by calculating the Carcinogenic Risk (CR), the "probability of contracting cancer over the course of a lifetime, assuming continuous exposure" . By using the oral reference dose (3.0E_4 mgkg-1 day-1) and oral slope factor (1.5 mgkg-1 day_1) of arsenic. Carcinogenic Risk (CR) in the Obuasi Municipality was estimated by determining the incremental probability of individuals developing cancer over a long period due to exposure to arsenic a potential cancer causing substance . Relative Bio-accessibility (RBA) was used in an equation proposed by [13,19] since the total soil arsenic content was not absolutely bio-accessible . Hazard Index (HI) the sum of the Hazard Quotients for multiple substances was obtained by summing the HQ values of As, Cd and Cr. A Hazard Index less than or equal to unity (HI ≤ 1) the target value for non-carcinogenic risk is an indication of unlikely chances of non-carcinogenic health impacts over a lifetime of exposure in the Obuasi Municipality. An HI greater than 1 (HI ≥ 1) does not necessarily connote the likelihood of adverse impacts [13,16,21]. The single contamination and comprehensive contamination index methods were used to evaluate the risks associated with consuming Manihot esculenta (cassava roots), Zea mays (corn) and Musa paradisiaca (plantain) cultivated on reclaimed mining sites. Single contamination index used to ascertain the tangible quantitative information of pollutants is being used in recent assessments with reference to the degree of heavy metal pollution. The single contamination index calculated as the ratio of the measured concentration of heavy metal in the ith functional area to the background contamination value of heavy metal  was calculated from data of laboratory analysis for corn, cassava and plantain based on the formula 6. Ii = The single contamination index of contamination in the ith functional area. Ci = The measured concentration of contamination in the ith functional area. Si = The background contamination value of heavy metal. The interpretation of the results based on the grading standard of single contamination index is shown in Table 1. The comprehensive contamination index which brings out the cumulative effect of different heavy metals by not only using extreme values in its calculation but also gives information on the quality of the environment based on weighted multi-factors  was calculated for corn, cassava and plantain based on the formula 7. I = Comprehensive contamination index. Iimax= Maximum value in the single contamination index. Iimean= Average value in the single contamination index of each contamination. The interpretation of the results based on the grading standard of comprehensive contamination index is shown in Table 2. The bioconcentration factor (BCF), which describes the transfer of heavy metal(loid)s from soil to crops, was calculated as the individual ratios between the concentrations of arsenic, cadmium, chromium, mercury and copper in corn, cassava and plantain cultivated on rehabilitated pits to dumps of a gold mining firm participating in the AKOBEN Programme based on dry weight . Data for Table 3 is presented as scenarios 1 and 2 for adults and children concerning soil ingestion for reclaimed sites and their respective controls sites namely, Adubriem, T3, T1, Nhyiaeso and Sansu. Average daily intake ADII in mgkg-1 day-1 represents the average daily intake of heavy metals from soil ingestion, hazard quotient (HQ) represents the non-carcinogenic hazards. An HQ < 1 is an acceptable level for arsenic while an HQ > 1 indicates a relatively high non-carcinogenic risk with reference to human health. A Carcinogenic risks (CR) exceeding 1E-04 is unacceptable, risks less than 1E-06 poses an insignificant health risk, and risks in the range 1E-04 and 1E-06 is acceptable for arsenic. The highest average daily intake (ADI) of arsenic for both adults (2.94E-04 mgkg-1 day-1) and children (2.50E-03 mgkg-1 day-1) with reference to ingestion was recorded at T1. Table 4 shows scenarios 1, 2 and 3 for children, adult males and females for dermal absorption of soil at reclaimed sites and their respective controls sites. A Hazard Quotient (HQ) < 1 is an acceptable level for arsenic while an HQ > 1 indicates a non-carcinogenic risk for human health. A Carcinogenic risks (CR) exceeding 1E-04 is unacceptable, risks less than 1E-06 poses an insignificant health risk, and risks in the range 1E-04 and 1E-06 is acceptable for arsenic. Highest average daily intake (ADI) of arsenic in the order children (4.48E-04) > males (2.15E-05) > females (1.85E-05) was recorded at T1. Table 5 shows bio-concentration factors for the transfer of arsenic, cadmium, cobalt, chromium, copper and mercury at rehabilitated pits at Adubriem (Ad), T1 and rehabilitated dumps at Nhyiaeso (Nhy) and Sansu (San). BCFCd = Bio-concentration factor for soil to crop arsenic, BCFCo = Bio-concentration factor for soil to crop cobalt, BCFCd = Bio-concentration factor for soil to crop cadmium, BCFCr = Bio-concentration factor for soil to crop chromium, BCFHg = Bio-concentration factor for soil to crop mercury and BCFCu= Bio-concentration factor for soil to crop copper. Bio-concentration factors less than or equal to one (BCF ≤ 1) is an indication of absorbability but non accumulation of heavy metals and metalloid by plants whilst a bio-concentration factor greater than one (BCF > 1) indicates the accumulation of metal(loid)s by plants. Table 5: Bio-concentration factor soil-crop for staple crops at rehabilitated mined sites. Table 6 shows Single Contamination Index (ɪ) and Comprehensive Contamination Index (ɪCom) of arsenic, cadmium, chromium, lead and mercury for cassava, corn and plantain cultivated at rehabilitated pits namely Adubriem (Ad), T1 and rehabilitated dumps at Nhyiaeso (Nhy) and Sansu (San) and their respective controls from sites not under AKOBEN Programme monitoring. ɪCd, ɪAs, ɪCr, ɪHg, ɪPb and ɪCom are Single Contamination Index for metals. cadmium, arsenic, chromium, mercury and lead. ɪCom is the Comprehensive Contamination Index for a combination of cadmium, arsenic, chromium, mercury and lead. ɪCom < 1 indicates uncontaminated corn, cassava and plantain, 1 < ɪCom ≤ 2 represents lightly contaminated corn, cassava and plantain, 2 < ɪCom ≤ 3 represents medium contaminated corn, cassava and plantain and ɪCom > 3 represents severely contaminated corn, cassava and plantain. There was no soil-to-plant bioaccumulation with reference to arsenic in all the analysed Manihot esculenta, Zea mays and Musa paradisiaca from all reclaimed sites (Table 5). A bio-concentration factor of ≤ 1 is an indication that Manihot esculenta only absorbs but does not accumulate arsenic . The high arsenic concentration in soils, Adubriem (343 ppm), Nhyiaeso (529 ppm), T1 (736 ppm) and Sansu (353 ppm) all exceeding the Dutcht IVL (Table 7) could be attributed to arsenic levels in the Obuasi Municipality being among the highest in the world, due to arsenic's association with arsenopyrite rich gold-bearing ores [26-28]. The low bioaccumulation and subsequent non bioavailability of arsenic in Manihot esculenta cultivated on the rehabilitated pits and dumps could be attributed to the fact that arsenatej the form in which plants take up arsenic from the soil is quickly reduced to arsenitek by the plants and channelled into media external to the plant or transported to shoots [29,30]. jArsenic (arsenate) is an analogue to phosphorous (phosphate) and its uptake in plants is similar to that of phosphate a macronutrient in many respects even though arsenate has no known use in plants. kArsenite is any compound containing an arsenic oxoanion where arsenic has oxidation state +3. The heavy metals, cadmium, mercury, and lead present in agricultural soils at the reclaimed sites were also present in Musa paradisiaca, Zea mays and Manihot esculenta harvested from these sites. Bio-concentration factors shown in (Table 5) calculated for the transfer of elements from soil to Zea mays at Adubriem were in the decreasing order of Cd (0.1) > Cu (0.07) > Hg (0.04) > Cd (0.02) > Co (0.009) and for T1 Cu (0.58) > Cd (0.333) > Hg (0.05) > Cr (0.027) > Co (0.001). The Adubriem and T1 sites had a bio-concentration factor (BCF) of ≤ 1 a confirmation of the low bioavailability of cadmium, mercury, chromium, cobalt and copper in corn. The significantly low bioavailability of mercury in the corn cultivated at both the rehabilitated pit and dump at Adubriem and T1 could be attributed to the fact that the roots of Zea mays acted as a barrier to the uptake of mercury [31-33]. The mercury content in Zea mays, which was 10-12.5 times lower than the WHO maximum permitted concentration of mercury (< 0.5 ppm) in cereals could be attributed to the significant role the foliar of Zea mays, played in the uptake of mercury from the air [33,34]. The roots of the Zea mays cultivated on rehabilitated pits at Aduriem and T1 readily took up cadmium from soil and subsequently transferred to storage organs above ground level due to the high mobility of cadmium . The cadmium uptake by Zea mays roots was however dependent on the availability and concentration of soil cadmium and not by plant demand since cadmium is not known to play any physiological role in corn [32,35]. The low bio-availability of cadmium (BCFCd ≤ 1) for Zea mays cultivated at Aduriem and T1 (Table 5) could therefore be attributed to the extremely low soil cadmium concentration of 0.1 ppm and 0.06 ppm respectively recorded at these site and the fact that Zea mays belongs to the family Gramineae a known shoot cadmium excluder . Residents of the Obuasi Municipality are unlikely to suffer from the negative impacts associated with cadmium exposure via ingestion of Zea mays cultivated on rehabilitated pit and dump at Adubriem and T1. The low bio-concentration factor for chromium (0.02 and 0.026 for Adubrium and T1 rehabilitated pits) is an indication of the poor correlation that exist between Zea mays tissues chromium concentrations and soils chromium concentrations. The low bioavailability of chromium (soil to Zea mays BCFCr of ≤ 1) could be attributed to Zea mays (family Gramineae) not having the ability to accumulate chromium in its tissues. Plants belonging to the family Brassicaceae (e.g. cabbage) which even accumulate huge quantities of chromium, perhaps due to similarities in chemical composition of sulphate and chromate ions only accumulate a tiny fraction in edible parts of plants. Since humans need trace amounts of chromium an essential mineral that is not synthesized by the human bodyl, it must be obtained from food consumed by humans. The tiny fractions of chromium accumulated in edible parts of plants is just enough to meet the nutritional requirements for the human diet for which reason chromium is hardly toxic to plants [1,38]. The low bio-accumulation may also be attributed to the immobility of chromium in both soils and plants . lSee https://medlineplus.gov/ency/article/002418.htm for more on chromium in diet. The low bio-accumulation of copper in crops cultivated on the rehabilitated pits and dumps can be attributed to the fact that copper is a micronutrient and thus required in small quantities by plants . Soil to Zea mays, Manihot esculenta and Musa paradisiaca copper bio-concentration factors BFCCU. < 1 observed at Nhyiaeso, Sansu, Adubriem and T1 can be ascribed to the possession of an efficient homeostatic mechanism by the three crops. The crops used their efficient homeostatic mechanism for the regulation of copper levels thus making the Zea mays, Manihot esculenta and Musa paradisiaca relatively insensitive to the concentration of copper in the soil at the rehabilitated sites. Additionally the Zea mays, Manihot esculenta and Musa paradisiaca cultivated at the rehabilitated pits possessed a translocation barrier that ensured that excess copper from roots to shoots was regulated in their shoots to tolerable levels for livestock and humans [41,42]. The contamination indices for arsenic, chromium and mercury were not calculated for plantain due to the absence of acceptable limits for these heavy metal(loid)s with reference to their concentrations in Musa paradisiaca. There is no risk associated with consuming Zea mays, Manihot esculenta and Musa paradisiaca from Adubriem, T1 and Nhyiaeso. There is however a light risk associated with cassava from the Sansu reclaimed site ɪCom = 1.13 (Table 6). 1 < ɪCom ≤ 2 is an indication of lightly contaminated Musa paradisiaca harvested from the Sansu reclaimed site. The low risk associated with the Sansu site can be attributed to the relatively high single contamination indices ɪCr = 1.54 for chromium and ɪA = 0.4 for arsenic respectively (Table 4). Due to the absence of slope factors for cadmium and chromium, carcinogenic risk (CR) was determined for arsenic only. In scenarios 1 (adult soil ingestion agriculture use) and 2 (children soil ingestion agriculture use), the developmental stage of the individuals (adult or child) was extremely important in determining the average daily intake (ADI) of soil as a result of their different ingestion rates . Whilst adults are reported to ingest a daily average of 100 mg soil day-1, children (1-6 years) ingest soil at the rate of 200 mg soil day-1 . Four (4) rehabilitated sites namely Adubriem, T1, Sansu and Nhyiaeso had carcinogenic risk attributable to arsenic through the ingestion of soil for adults within the acceptable range of 1E-04 and 1E-06 (Table 3) while T3 had a carcinogenic risk 2.56E-07 (Table 3) an indication of no significant health effects [13,21]. Two (2) out of five (5) rehabilitated sites namely Sansu and Nhyiaeso had carcinogenic risk attributable to arsenic through the ingestion of soil for children being unacceptable with carcinogenic risks exceeding 1E-04. With children being the most susceptibility to heavy metals, children (1-6 years) in the Obuasi Municipality who ingest soil at the rate of 200 mg soil day-1 could suffer from cancers of the bladder, lungs, kidney, and skin [13,43,44]. Carcinogenic Risk (CR) of arsenic attributable to dermal contact of soil because of agriculture was calculated taking in consideration gender (adult males, adult females) and developmental stage (adult or child). This was done to ensure that the variations in exposed skin surface area available for dermal contact in adult males (0.122 m2) feet and hands, (0.1055 m2) female adults feet and hands and (0.121 m2) for children feet, arms, legs and hands  were not over represented. The Carcinogenic Risk values for scenario three (3) Adults male dermal absorption, scenario four (4) Adults female dermal absorption and scenario five (5) Children dermal absorption were less than 1E-04 (Table 2) for which reason CR is considered acceptable with no likely health impacts attributable to arsenic in the Obuasi Municipality [13,21]. None of the treatment sites (Adubriem, T1, T3, Nhyiaeso and Sansu) had a non-carcinogenic risk associated with ingesting arsenic contaminated soils for both adult and children as all Hazard Quotient values were less than one (HQ < 1) (Table 3) . Non-carcinogenic risk was also absent for the dermal absorption scenarios 3, 4 and 5 (Table 4) HQ < 1 as reported by . This could largely be attributed to the oxidation of the oxide material (soil) used for the backfilling of these sites. In a scenario where the HI values are less than one (HI < 1), the exposed population in the Obuasi Municipality will not suffer from adverse health effects associated with the cumulative impacts of arsenic, cadmium and chromium. In a scenario where the HI values exceed one (HI >1), the exposed population in the Obuasi Municipality are likely to suffer adverse health effects associated with the cumulative effects of arsenic, cadmium and chromium . The non-carcinogenic risks associated with any of the reclaimed sites with regards to agricultural use for children and adults were absent but the carcinogenic risk attributable to arsenic which was associated with two reclaimed sites for children aged 1-6 years was noticeably present. This risk was present because of the geology of the study area, which is extremely abundant in arsenopyrite albeit made much accessible by mining activities. Results for bioaccumulation factor, soil-to-crop bioconcentration factor, single and comprehensive contamination indices confirmed the non-bioavailability of heavy metal(loid)s in Zea mays, Manihot esculenta and Musa paradisiaca cultivated on reclaimed mined sites at the study area. The much dreaded transfer of the studied heavy metal(loids) through the consumption of staple crops cultivated on reclaimed mined sites in the study area may at best be described as a misconception borne out of the debilitating effects of heavy metals. Acosta J, Faz A, Martínez-Martínez S, Zornoza R, Carmona D, et al. (2011) Multivariate statistical and GIS-based approach to evaluate heavy metals behavior in mine sites for future reclamation. Journal of Geochemical Exploration 109: 8-17. Shesterin IS (2010) Water pollution and its impact on fish and aquatic invertebrates. In: Lysemko C, Squires V, Verheye WH, Interactions: Food, Agriculture And Environment UNESCO Publishing-Eolss Publishers, Oxford, UK, 59-69. Jain RK, Cui ZC, Domen JK (2016) Environmental impact of mining and mineral processing: Management, monitoring, and auditing strategies. Butterworth-Heinemann, Oxford, UK. Nesaratnam ST (2014) Water Pollution Control. John Wiley & Sons, Hoboken, New. Coussy S, Benzaazoua M, Blanc D, Moszkowicz P, Bussière B (2012) Assessment of arsenic immobilization in synthetically prepared cemented paste backfill specimens. Journal of environmental management 93: 10-21. Oves M, Khan MS, Zaidi A, Ahmad E (2012) Soil contamination, nutritive value, and human health risk assessment of heavy metals: An overview. In: Toxicity of heavy metals to legumes and bioremediation. 1-27. Akbarzadeh A, Jamshidi S, Vakhshouri M (2015) Nutrient uptake rate and removal efficiency of Vetiveria zizanioides in contaminated waters. Pollution 1: 1-8. Nasrabadi T (2015) An index approach to metallic pollution in river waters. Int J Environ Res 9: 385-394. Wang S, Mulligan CN (2008) Speciation and surface structure of inorganic arsenic in solid phases: A review. Environment International 34: 867-879. USEPA-United States, Environmental Protection Agency (1989) Risk assessment guidance for superfund. Fitton G (2014) X-ray fluorescence spectrometry. In: Gill R, Modern Analytical Geochemistry: An introduction to quantitative chemical analysis techniques for Earth, environmental and materials scientists, Routledge, UK. Mari M, Nadal M, Schuhmacher M, Domingo JL (2009) Exposure to heavy metals and PCDD/Fs by the population living in the vicinity of a hazardous waste landfill in Catalonia, Spain: Health risk assessment. Environ Int 35: 1034-1039. Li Z, Ma Z, Van Der Kuijp TJ, Yuan Z, Huang L (2014) A review of soil heavy metal pollution from mines in China: Pollution and health risk assessment. Science of The Total Environment 46: 843-853. Martínez-Sánchez MJ, Martínez-López S, Martínez-Martínez LB, Pérez-Sirvent C (2013) Importance of the oral arsenic bioaccessibility factor for characterising the risk associated with soil ingestion in a mining-influenced zone. J Environ Manage 116: 10-17. USEPA-United States, Environmental Protection Agency (2002) Supplemental guidance for developing soil screening levels for super fund. USEPA-United States Environmental Protection Agency (2014) National Air Toxics Assessment. USEPA-United States, Environmental Protection Agency (2001) Baseline human health risk assessment Vasquez Boulevard and I-70, Denver CO.
USEPA-United States, Environmental Protection Agency (2013) Region 9, Regional screening. USEPA-United States, Environmental Protection Agency (2007) Guidance for evaluating the oral bioavailability of metals in soils for use in human health risk assessment. Luo XS, Ding J, Xu B, Wang YJ, Li HB, et al. (2012) Incorporating bioaccessibility into human health risk assessments of heavy metals in urban park soils. Sci Total Environ 42: 88-96. Hu X, Zhang Y, Luo J, Wang T, Lian H, et al. (2011) Bioaccessibility and health risk of arsenic, mercury and other metals in urban street dusts from a mega-city, Nanjing, China. Environ Pollut 159: 1215-1221. Hong-gui D, Teng-feng G, Ming-hui L, Xu D (2012) Comprehensive assessment model on heavy metal pollution in soil. Int J Electrochem Sci 7: 5286-5296. Dong J, Yang QW, Sun LN, Zeng Q, Liu SJ, et al. (2011) Assessing the concentration and potential dietary risk of heavy metals in vegetables at a Pb/Zn mine site, China. Environmental Earth Sciences 64: 1317-1321. Lui WX, Li HH, Li S, Wang YW (2006) Heavy metal accumulation of edible vegetables cultivated in agricultural soil in the suburb of Zhengzhou City, People's Republic of China. Bull Environ Contam Toxicol 76: 163-170. Singh J, Upadhyay SK, Pathak RK, Gupta V (2011) Accumulation of heavy metals in soil and paddy crop (Oryzasativa), irrigated with Water of Ramgarh Lake, Gorakhpur, UP, India. Toxicological and Environmental Chemistry 93: 462-473. 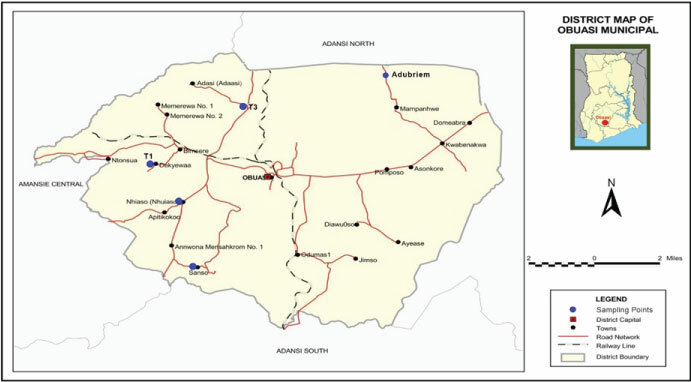 Amonoo-Neizer E, Nyamah D, Bakiamoh S (1996) Mercury and arsenic pollution in soil and biological samples around the mining town of Obuasi, Ghana. Water, air, and soil pollution 91: 363-373. Smedley P, Edmunds W, Pelig-Ba K (1996) Mobility of arsenic in groundwater in the Obuasi gold-mining area of Ghana: Some implications for human health. Geological Society, London, Special Publications 113: 163-181. Kumi-Boateng B (2007) Assessing the spatial distribution of arsenic concentration from goldmine for environmental management at Obuasi, Ghana. Zhao F, Ma J, Meharg A, McGrath S (2009) Arsenic uptake and metabolism in plants. New Phytol 181: 777-794. Alloway BJ (2013) Sources of heavy metals and metalloids in soils. In: Heavy metals in soils. (3rd edn), Springer, Dordrecht, London, 11-50. Graydon JA, St Louis VL, Hintelmann H, Lindberg SE, Sandilands KA, et al. (2009) Investigation of uptake and retention of atmospheric Hg(II) by boreal forest plants using stable Hg isotopes. Environmental Science & Technology 43: 4960-4966. Osman KT (2013) Soil pollution. In: Soil degradation, conservation and remediation. Springer, Reading, UK, 149-226. Steinnes E (2013) Mercury. In: Alloway BJ, Heavy metals in soils: Trace metals and metalloids in soils and their bioavailability, Environmental Pollution. Springer, Reading, Netherlands, 411-424. Låg J, Steinnes E (1978) Contents of some trace elements in barley and wheat grown in Norway. Meldinger fra Norges Landbrukshoegskole 57: 11. Smolders E, Mertens J (2013) Cadmium. In: Alloway BJ, Heavy metals in soils: Trace metals and metalloids in soils and their bioavailability, Environmental Pollution. Springer: Reading, Netherlands, 283-307. Swartjes FA (2011) Dealing with contaminated sites: From theory towards practical application. Springer Science & Business Media, Reading, UK. Adriano DC (2001) Ecological and Health Risks of Metals. In: Trace Elements in Terrestrial Environments. (2nd edn), Springer, New York, 136-165. Zayed AM, Terry N (2003) Chromium in the environment: Factors affecting biological remediation. Plant and Soil 249: 139-156. Kabata-Pendias A, Pendias H (2001) Trace elements in soils and plants. (3rd edn), CRC Press: Boca Raton, Florida, USA. Marschner H (2011) Marschner's mineral nutrition of higher plants. Academic press, London, UK. Sadhra SS, Wheatley AD, Cross HJ (2007) Dietary exposure to copper in the European Union and its assessment for EU regulatory risk assessment. Sci Total Environ 374: 223-234. EU-European Union (2008) European union risk assessment report. Voluntary risk assessment of copper, copper II sulphate pentahydrate, copper (I) oxide, copper (II) oxide, dicopper chloridetrihydroxide. 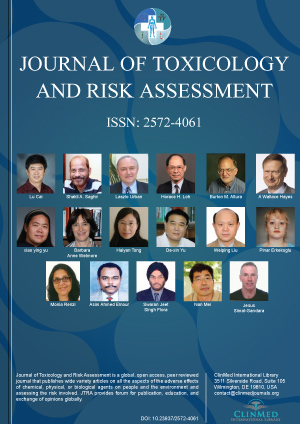 Qu C, Sun K, Wang S, Huang L, Bi J (2012) Monte carlo simulation-based health risk assessment of heavy metal soil pollution: A case study in the Qixia mining area, China. Human and Ecological Risk Assessment: An International Journal 18: 733-750. ATSDR-Agency for Toxic Substances and Disease Registry (2007) Toxicological profile for arsenic. Man YB, Sun XL, Zhao YG, Lopez BN, Chung SS, et al. (2010) Health risk assessment of abandoned agricultural soils based on heavy metal contents in Hong Kong, the world's most populated city. Environ Int 36: 570-576. Kenneth Bedu-Addo, Department of Environmental Planning, Brandenburg University of Technology, Cottbus-Senftenberg, Germany, Willi-budichStrasse 17, 03044, Cottbus, Germany, Tel: +4915212085579. © 2018 Bedu-Addo K, et al. This is an open-access article distributed under the terms of the Creative Commons Attribution License, which permits unrestricted use, distribution, and reproduction in any medium, provided the original author and source are credited.